Sanrio World Smashball! 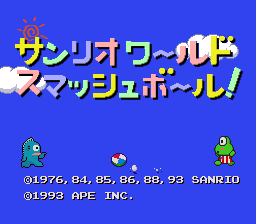 is a fun little game released in Japan for the Super Famicom. It is reminiscent of some older classics like brick or pong, but with a cute style that can only come from Sanrio. You can choose amongst four popular Sanrio characters: Keroppi, Tabo, Pokopon and Hangyodon, each with their own unique strengths and weaknesses. With up to 30 different levels in single player mode and a selection of 20 arenas for multi-player mode, this game can provide hours of non-stop entertainment. So watch out...you may just get addicted! Internal Title SANRIO SMASH BALL!